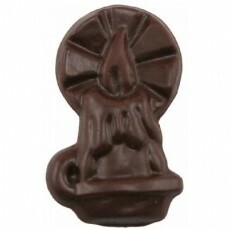 Get delectable Belgian chocolate in the shape of candles. This chocolate candle is a sign of celebration and hope and is available in 4 different flavors - milk, dark, dark mint and white. They can be wrapped in colored foils of your choice and labeled with up to 4 colors of printing. You could also have them in cello bags, tied with a ribbon in a color of your choice.